Paul Luther became acquainted in Torgau with Anna of Warbeck, the daughter of the former capitular of Altenburg and current Saxonian vice chancellor Veit of Warbeck, who was before his relocation to Saxony princely court counsellor in Swabia. Anna was a jaunty, young girl. She wore a long skirt from damask with a velvet train. Because violating the princely dress code therefore she was amerced by the city council of Torgau. Anna complained to Elector Moritz of Saxony, who sent the following order to Torgau: ... we have been informed by the honourable, our beloved special damsel Anna of Warbeck humbly complaining, that you have forbidden to her to wear the damask skirt with the velvet train and furthermore you have imposed a fine of some gulden on her. Though we know to remember us now, what we have let write for the police rules, so we note however, that the father of the damsel had been an aristocrat and princley court counsellor, also the damask, from which the skirt had been made, has been donated princely. Therefore we allow, that she may wear such skirts, and we call on you to do the same and to spare her to pay the requested fine. Also in the future you may act in this way, so that she has no cause to complain again. The engagement of Paul Luther with Anna of Warbeck gave once again a gleam of hope to Katharina Luther. More than three months Katharina was sick. Often she prays, God may the purity of his doctrine, which her husband with his work has brought back to this age, hold pristinely for the descendants. She herself wants to stick to Christ like a burdock on the dress. At 20. December 1552 the widow of the Reformer closed her eyes. Paul Eber, vice rector of the university, announced her dead with an obituary written by Melanchthon: Together with her orphaned children the as widow already strong burdened had to stray under greatest threats, like an outlaw. She has received great ingratitude by many, and she has been cheated ignominiously by those she hoped to obtain benefits due to the enormous achievements of her husband. Johannes Luther, the eldest son, was came in a hurry to Torgau, where he together with his both brothers and his sister has buried the mother. The University has called to accompany the wife of the great man of God on the last road. With great solemnity Martin Luther's wife was buried, the boys choir sang her last song. 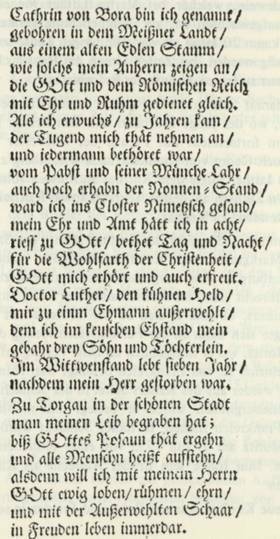 An epitaph, well-preserved still today, was fixed in the Church of Torgau to her memory and Balthasar Mentius wrote a poem for Katharina. mit Ehr und Ruhm gedienet gleich. GOtt mich erhört und auch erfreut. gebahr drey Söhn und Töchterlein. nachdem mein Herr gestorben war. in equal measure with honour and glory. God heared me and delighted me. three sons and one daughter. after my husband was died. Johannes Luther as eldest of the family had now to care for his both brothers and his sister. Few weeks, after the mother was buried, the 20 year old Paul married the Anna of Warbeck in Torgau. Without doubt, this was the meaning of his father, who has advised also Johann Schneidewein, who is grown up at Martin Luther like a own son, to marry as he was barely 20 years old. The Reformer meant, shall not be rambling, learn betimes to tend the house and to bear the cross. Shortly after the University could return to Wittenberg, where the young husband and his brother Martin continued their studies. To the delight of his sister Margareta returned Georg of Kunheim to Wittenberg too. Johannes Luther responded to a call of Emperor Johann Friedrich of Saxony to the new residence in Weimar as secretary and lawyer. In summer 1553 Elector Moritz of Saxony got into a military conflict with Margrave of Kulmbach-Bayreuth, Albrecht of Brandenburg. Margrave Albrecht was in the Schmalkaldic War on the side of the Emperor, although he is known to the Protestants. He then participated in the conspiracy of princes of the Elector Moritz, where he was involved significantly in the contract with King Henry II of France. Now Albrecht was again on the side of the Emperor. In the Battle of Peine near Lüneburg he was defeated and had to flee to France outlawed. In this battle on 9. July 1553 Elector Moritz was hit by a fatal bullet. His brother Albrecht followed him in the position as palatine elector of Saxony. The new elector was eager for peace and quiet in his country, encouraged the Protestant religion, and built up the art collections in Dresden. With him won the Leipzig fairs much importance in international trade. Elector Albrecht married Anna the daughter of King Christian III. of Denmark, which was called 'Mother Anna' because of her widespread charity. Elector Albrecht cultivated a close friendship with Johann Georg, the son of the Elector of Brandenburg Johannes II. Also there was a good contact to Luther's sons Johannes and Paul. He got along with Johann Friedrich of Weimar and therewith he reunited both Houses of Saxony. For a long time there was peace under his electoral government. Johannes Luther tried now to the distribution of an estate according to the testament of the father. On 29 June 1553 the siblings met in Wittenberg with their uncle Jacob Luther from Mansfeld, the brother of the reformer. In the presence of Philipp Melanchthon and the mayor Ambrose Reiter, the princely appointed guardians, they shared the heritage. The fief Wachsdorf was entitled only to the three sons. To compensate Margareta received the two gardens at the Specke, the hop garden and the tree garden at Saumarkt; because the gardens were only with about 500 gulden value to be attributed, Wachsdorf with the then minimum purchase price of 2,200 gulden, she got by the brothers jointly a compensation in the amount of 125 gulden. The salary for the servants of the farm the siblings contributed in equal parts, because of the common use until Easter 1554. Thenceforward the brothers should take over alone all buildings, affiliations and the livestock. All fruits were on the joint distribution, and one brother should have appointed a controller, from whom he receives the bill. The payment to Margareta should be taken from the outstanding 1000 gulden from Mansfeld, that had still to distribute. The house in Wittenberg remained in joint possession and was priced probably with a value of around 4,000 gulden. The rental of rooms and other uses were divided among the four siblings. The silver and furniture, all houshold appliance in tin, brass and copper, table and cabinets were divided evenly, in doing so the sister was allowed to choose the most beautiful piece. However, the books of D. Martin Luther were divided among the sons. All these appliance may have been priced with a value of 1,200 gulden and 800 gulden for the books. As a result of the war adversities and of the flight some debts were grew up, that had to compensate. For this the farm in Zülsdorf was sold with all livestock and equipment to mayor Christoff Keller for 956 Gulden. In addition to the debt some silver was still pawned, that was redeemed in equal shares. After this approximately 400 gulden remained from the proceeds of the Zülsdorf farm. You has to add Brauer's booth, the small house near the Black Monastry has been buyed for 430 gulden, but later has been investes much money. Consequently the assets of the reformer with about 12,000 gulden valuation, then conditions for a considerable assets, has been divided among his children. In April 1554 this distribution of an estate was documented by Johannes Schneidewein, Philipp Melanchthon, Jacob Luther and Ambrose Reiter signed and sealed. The settlement of the debts was handled probably by Melanchthon. In a letter dated 13 October 1553, he wrote to Johannes Luther, after he had been visited by his servant Andreas: ... also he said nothing about the matter, if he would be reconciled by the money, that we offered. Paul Luther spent the first years of marriage with Anna of Warbeck in the Black Monastery and continued medical studies. Also Margareta and Martin, who took care now to Wachsdorf, remained here. Elector Johann Friedrich died on 3 March 1554 in Weimar. His son, Duke Johann Friedrich the Middle was his successor. Now Johannes Luther was in his services. At the end of 1554 he attended as Saxonian counsellor the general visitation of the Weimarian churches together with Nikolaus of Amsdorf. Lucas Cranach the Elder is already 1547, because of the Schmalkaldic war, relocated to Weimar and here he died on 16 October 1553. Is continued with part 3 in the next issue of qoqa.de!